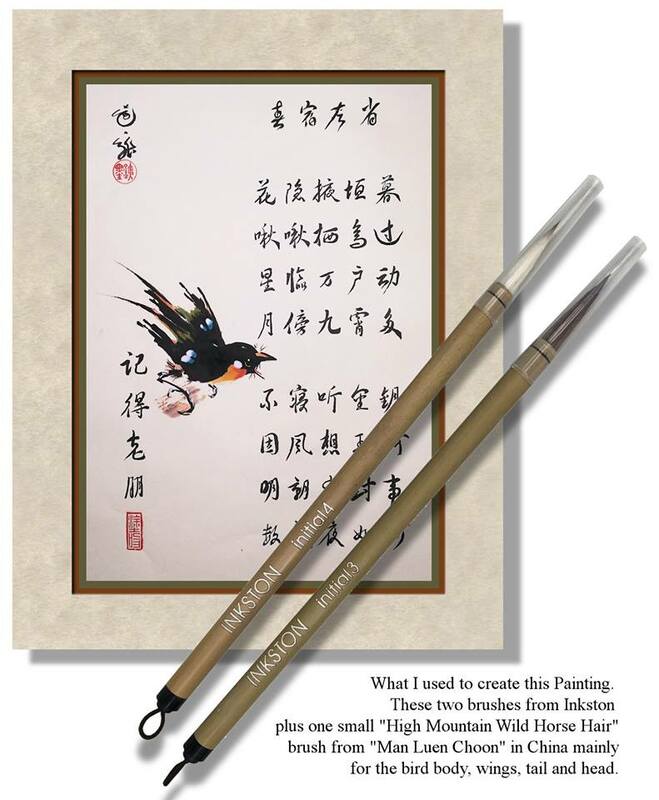 This set is designed and made by Inkston Brush workshop specially for beginners of Chinese painting/ calligraphy. One set includes 4 brushes: Initial 1, Initial 2, Initial 3, and Initial 4. Each brush has different sizes and is made with different animal hair types. 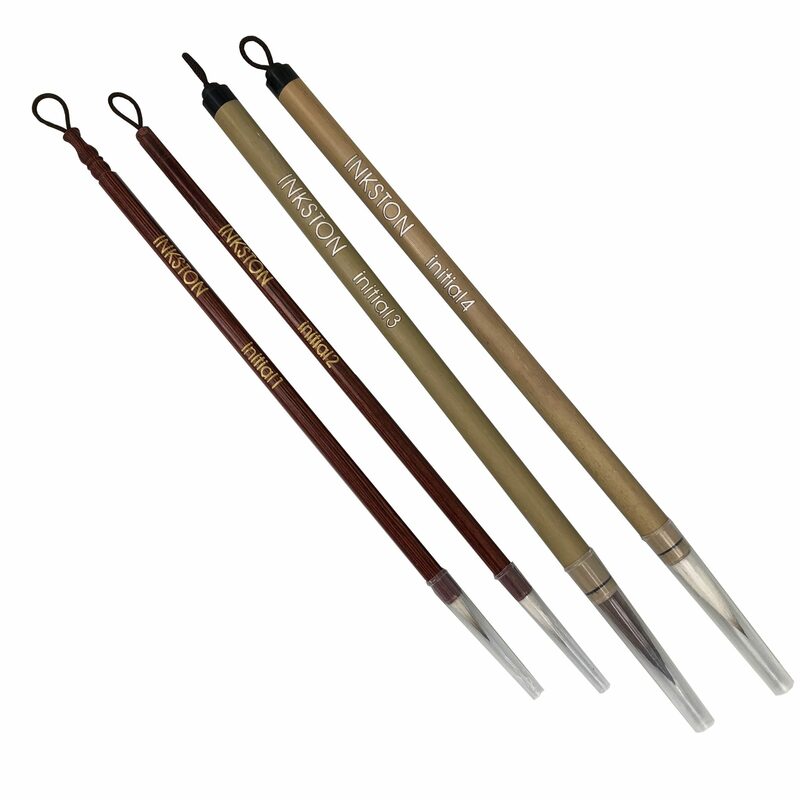 One set of such brush can meet almost all the needs of beginners for both calligraphy and painting. It is a very good value and useful set. The No.3 brush I use “broken” (Use it almost dry scratched/split the hairs at the end to paint many random lines) which takes a bit of doing because new brushes dont like being “split”. So I have to be brutal. BUT I WANT that brush style. i WANT the end to “break” as I put pressure on the bristles. Otherwise I do not get that “scratchy scrape” across the paper and I do not get the frayed mark I need from it for the head and feathers. The No.4 brush I use for the eyes, beak, and some colors additions. “Toning” the blacks with translucent blues which you can only appreciate when the painting is seen in real life where the light refracts. Unbroken I use the No. 3 for the Calligraphy perfectly well. Bamboo Light & fast growing Bamboo is used as a construction material, as food, to make paper, to make stems for brushes, and as a traditional subject for painting. Weasel Hair “Wolf” brushes use hair from the Chinese “Yellow mouse wolf” 黄鼠狼 – a type of weasel. Premium Dong Lang Hao “Winter Wolf” brushes use the extra thick hairs produced in the winter in the cold and snowy North East China. The best weasel hair is fine and glistening, smooth and elastic and suitable for both large and small brushes. Weasel hair is not as quite stiff as rabbit hair but stiffer than wool and combination brushes, so it is preferred for detail work and regular script calligraphy (楷书 Kaishu). Weasel hair has lower absorption rate than wool and the hair is strong & flexible. Therefore, it performs very well on painting dry and ‘bone’ effects and for example for painting tree trunks with dry ink such as su ink. Wolf brushes are easier to control than Wool brushes and so are also recommended for beginners. Wool brush requires good control of wrist and strength. Therefore, it is more difficult than weasel hair brush for beginners to control. Handmade Xuan brushes from traditional workshop in Anhui – see our Xuan brush article and our brush buyers guide. Ideally use with Xuan Papers and Old Hu Kai Wen inksticks. Inkston Gongbi Detail LangHao Wolf Brush Set Red Star 墨 潇 然 Xuan brush set "Mo, Xiao, Ran"